So hopefully you've had enough time to watch at least one movie and note the sequences. Do you start to see how that works? By all means, keep watching movies to get familiar with sequence breakdown, but at the same time, let's move on. But this is the point in the brainstorming process that I feel I need to cover several different stages at once. First, I want to link to a blog on premise. More experienced writers will probably already have done this step, but if you have no idea what I'm talking about, go here and read. 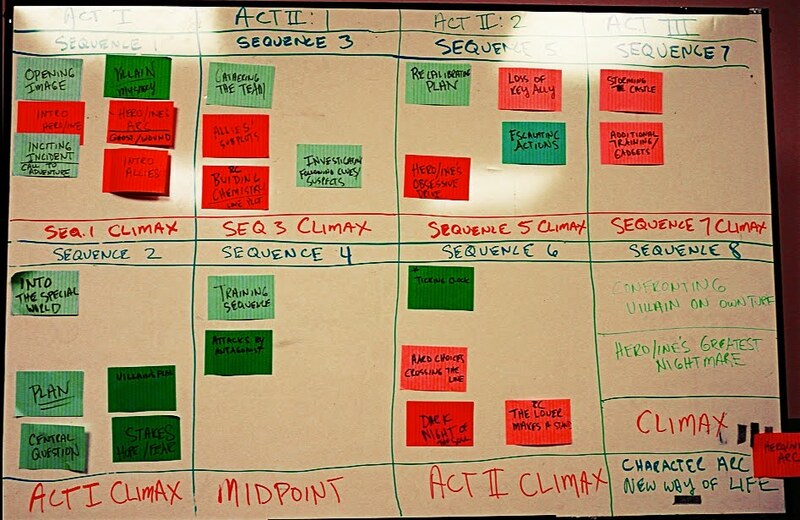 Make two blank structure grids, one for the movie you have chosen from your master list to analyze, and one for your WIP (Work In Progress). 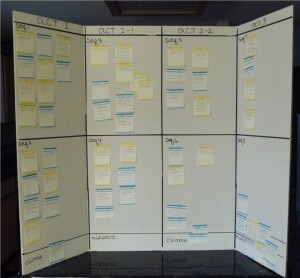 You can just do a structure grid on a piece of paper for the movie you’ve chosen to analyze, but also do a large corkboard or cardboard structure grid for your WIP. You can fill out one structure grid while you watch the movie you’ve chosen. 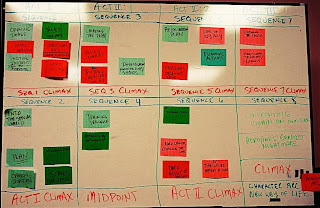 Get a pack of index cards or Post Its and write down all the scenes you know about your story, and where possible, pin them onto your WIP structure grid in approximately the place they will occur. And if you'd like to to see more of these story elements in action, I strongly recommend that you watch at least one and much better, three of the films I break down in the workbooks, following along with my notes. I do full breakdowns of The Proposal, Groundhog Day, Sense and Sensibility, Romancing the Stone, Leap Year, Notting Hill, Four Weddings and a Funeral, Sea of Love, While You Were Sleeping and New in Town in Writing Love. "A wonderfully dark thriller with amazing 'Is-it-isn't-it?' suspense all the way to the end. Highly recommended." Made my day to see some new blog posts! After I read your screenwriting book, I looked for more similar stuff. I read Save the Cat and found it rather lacking. The author is so rigid its ridiculous, right down to the exact page number where certain things should happen. I like your approach way better, its more fluid. I used this structure on the novel I'm just now finishing up, and it helped tremendously. Some of the negatives comments on my first book (without deliberate structure) said that the book dragged through the middle. I tend to agree. One of these days I'll pull it apart like an old car and rebuild it with a better story flow. One question - what about short stories? What kinds of modifications (if any) would you make to a shorter work? Used a variation of this method for a TV movie and a novel. I like Save the Cat! but find it more useful for comedy. I'm glad my suggestions make sense for the dreaded middle. That's where I find most story structure books most lacking, so I'm constantly refining my approach to teaching the middle to make it more comprehensible to people. As for shorts - I wrote a post on that, let me find it and link it. You're welcome, Frank! Yeah, I find it works equally well for film, TV and novels. Is it too late to go to bed? My list is getting out of hand. Must buy index cards. You mean the real kind—don't you?